NOT SURE WHICH PALLETS YOU NEED? Palletmasters is a leading Brisbane pallet manufacturer - we are here to help you find the right solution for all your pallet needs. Use the button below to contact us. WE KNOW EVERYTHING ABOUT PALLETS. 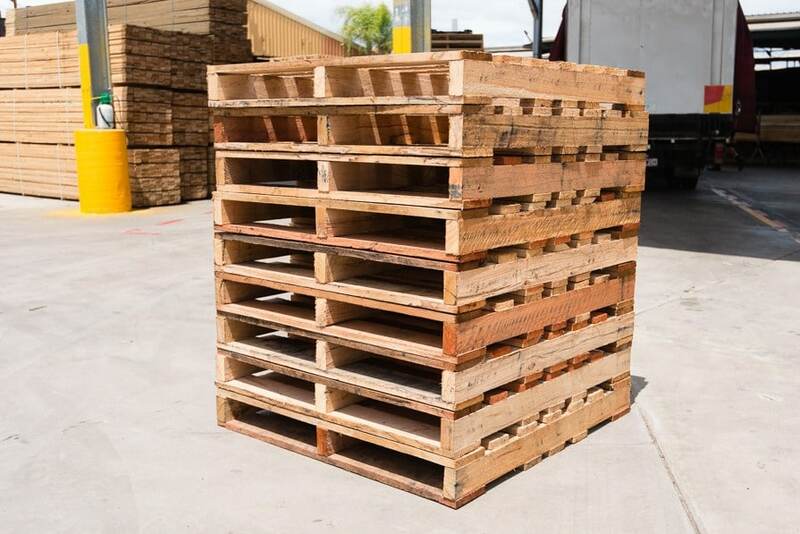 We make pallets in Brisbane for clients across Queensland and Australia - For any wooden pallet or crate requirements, Palletmasters can provide the best solution. Contact us today. We have a range of Pine, Hardwood, Heat Treated Pallets along with crates, skids, dunnage and export pallets. To find out more about our range of pallets contact us using the button below. Palletmasters is a proudly owned and operated family business based in Brisbane. We have experience in making pallets, crates, skids and dunnage since 1987. Looking for a leading pallet and crate manufacturer in the Brisbane area? Look no further than Palletmasters. We provide pallets for sale and a wide range of products that make assembling, transportation, loading and unloading of goods more efficient. Having provided quality pallets in Brisbane and timber products efficiently and cost-effectively for over 35 years, our experienced team of professionals can assist you with all requests. We manufacture and supply small and large wooden pallets, skids, wooden crates and timber dunnage for almost every purpose. Palletmasters is committed to providing market leading pallets in Brisbane at competitive prices. Many businesses trust us for high quality pallets for sale and wooden transport products. Pallets may be the simplest equipment in the warehouse, but they play an integral role in logistics operations. Our Brisbane pallet systems make freight and logistics easier. We can help you ensure safety, reduce costs and improve supply chain efficiency. Not sure what you need? No problem. Tell us what you’re shipping and we’ll tell you what’s required. Call us for a free, no obligation quote now. Our pinewood and hardwood palettes for sale in Brisbane provide many benefits. Our large or small pallets save space, allow efficient warehousing and allow your goods to be easily moved by forklifts. You can also shrink wrap our Brisbane pallets for protection in transit, storage and loading. Our large and small pallets are manufactured to standard dimensions and reduce your transportation costs. They also last and can be recycled! Our high-quality pine and hardwood pallets for sale are known for their durability to stand the test of time. Our Brisbane pallets manufacturing headquarters in Clontarf, Brisbane. Palletmasters design and custom build wooden pallets and wooden crates for businesses nation-wide, in small or large quantities. We can supply different pallet sizes of varying weight tolerances to match your product or industry specifications for domestic or export use. In addition to providing high-quality, large or small timber pallets, we manufacture timber crates made to your requirements. Palletmasters is your Brisbane-based manufacturer of quality products including: strong and durable hardwood pallets, disposable pine pallets, ISPM15 heat treated pallets and crates for export, rackable, warehouse pallets, branded pallets, pine or hardwood skids & pine crates. We aim to supply a wide range of wooden products that make handling, storing or moving goods and packages more cost-effective. We will work with you to provide the right product for the job. Get the best prices on customised, wooden pallets for sale in Brisbane. With a fantastic team and through ongoing investment in the highest quality machinery, we have been able to improve our business efficiency and cost to market. Palletmasters is focused on providing superior quality products that exceed our customer’s expectations at competitive prices. If you are looking for pallets in Brisbane, our extensive range of products and our commitment to maintaining long-term relationships with our customers makes your decision an easy one. Custom made pallets for any requirements. "A very big thank you to everyone involved in getting our pallets ready for us yesterday ahead of schedule. We do appreciate your excellence in service." "Many thanks for your help. The pallets worked out perfectly"